It is important to understand USDA Organic hay standards if you are producing an organic animal product or want to have your hay certified. Certified Organic hay is an important part of any organic livestock feeding program. If the hay isn't certified organic, any product that comes from livestock eating the hay will not be organic either. The USDA Organic standards for hay are the same as they are for any certified organic product. The hay must be grown in accordance with these standards or it cannot be certified. This process, as well as the added expense of organic fertilizers, keeps organic hay prices a bit above conventional hay. With only two exceptions, USDA Organic hay standards require that hay be grown by farmers that have completed the certification process. Furthermore, it must be handled and stored according to organic standards. It can't, for example, be fumigated. Any grower that grosses less that $5,000 per year does not have to be certified. These farmers are encouraged to understand organic policies, however, and to have a written farm plan that can be read by consumers. In addition, the small, uncertified grower may not sell his organic hay through a distribution center. It must be direct sales only. A distributor does not have to have a certified facility if he does not significantly change the product. Retailers do not need to be certified. Organic hay is primarily fertilized with organic manure, compost, and other natural products to keep the soil healthy and nutrient dense. If hay is to be labeled certified organic, it cannot have been grown from seeds that have been genetically modified. Once the hay has been cut, it can't be irradiated. Irradiation disqualifies any product from being labeled 100% Certified Organic. Certification is done by official inspectors who travel to farms and check a variety of things to make sure that the organic regulations are carefully followed. You can expect that your fields and storage facilities will be scrutinized carefully. You will need to be available to answer questions. Any problem of non-compliance that the inspector finds will be noted and you will receive an official notice asking you to comply within a certain amount of time or lose your certification. A .pdf file of the USDA national organic hay standards can be found at the Washington State Department of Agriculture. Be sure to read the regulations carefully. Make sure that you understand them before you begin the certification process. Always consult with people who are experienced in this area if you have any questions. 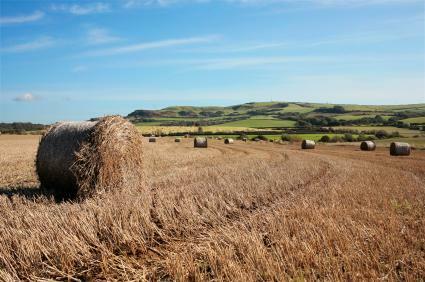 With consumers buying more organic products than ever, the demand for organic hay and other feeds will only increase.